A group of Stephen F. Austin State University students spent the semester creating "Qué Tiene la Música: Canciones, Poemas y Dibujos de Luis Enrique Mejía Godoy," a book of poetry, song lyrics and art pieces for their History of Latin American Culture course. 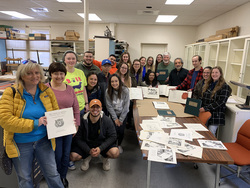 NACOGDOCHES, Texas - A group of Stephen F. Austin State University students spent the semester creating "Qué Tiene la Música: Canciones, Poemas y Dibujos de Luis Enrique Mejía Godoy," a book of poetry, song lyrics and art pieces for their History of Latin American Culture course. Dr. Juan Carlos Ureña, professor of Spanish, instructed his students to select song lyrics and poems to accompany art produced by Luis Enrique Mejía Godoy, a prominent Nicaraguan musician and artist. Godoy's work covers topics on Nicaraguan popular culture, including love, nature and life's struggles. His art honors historic Latin American heroes and fighters. Ureña, who is a musician himself, said he tries to incorporate genuine Latin American art and music into his teaching. "I have always combined art with literature and culture." Godoy's art is heavily influenced by the pre-Colombian era and contains many faces and symbols that pay homage to indigenous cultures and folklore, according to Ureña. Throughout the semester, students in Ureña's course studied the cultural, poetic and historical aspects of various songs. They then paired many of the songs with the different art pieces they complemented. "Students had to study the lyrics of songs and the meaning of the art," Ureña said, "and I think it helped them better understand how the arts influence culture." The class members collaborated for five weeks with the LaNana Creek Press to produce 50 artistic copies of the book containing the songs and artwork. A commercial version of the book also will be available for purchase in the spring. A majority of the proceeds from book sales will go to families and individuals in Nicaragua who have been affected by the political unrest the nation is facing. "This book was created in solidarity with the Nicaraguan people, and it was created to promote their culture," Ureña said. "It was really nice to bond with my classmates and also work together to see the final product. Just looking at the book reminds me of the time I spent with my classmates, so it's been a very beneficial project," said Cynthia Villarreal, a psychology major with a minor in Spanish. Students played a key role in the creation of the book, as they decided on its look and style, including the type of paper used. Charles Jones, director of the LaNana Creek Press, taught students how books are made with a printing press. During the semester, students visited the press and gained experience. Many helped print pages, glue bookbindings and create the book covers. Overall, the project accomplished one of Ureña's main objectives: Students finished the class with a deeper appreciation and understanding of the role art plays in culture. For more information on SFA's Department of Languages, Cultures and Communication, visit sfasu.edu/langcomm.